Tough new biofuel targets coming into force on Sunday (15 April 2018) will double the use of renewable fuels in the UK transport sector within 15 years, cutting the sector’s reliance on imported diesel. Changes to the Renewable Transport Fuel Obligation (RTFO) will compel owners of transport fuel who supply at least 450,000 litres a year or more, to make sure the mix is at least 12.4% biofuel by 2032. Currently the industry, which supplies fuel to transport companies such as haulage firms and airlines, is only expected to meet a target of 4.75% biofuel. The government is also challenging the sector to reduce greenhouse gas emissions by 6% by 2020 – which coupled with the RTFO changes will support the UK’s low carbon fuel industry while helping make sure the UK transport sector is one of the most sustainable in the world. "We are committed to reducing carbon emissions from transport to tackle climate change, and to making the sector as sustainable as possible. Increasing our use of renewable fuels is a key part of this. "The changes we are introducing will double our carbon emissions savings from the RTFO scheme by doubling the use of renewable fuels and reducing reliance on imported fossil diesel. "This will deliver emissions savings equal to taking hundreds of thousands of cars off the road." The changes to the RTFO scheme announced today will also, for the first time, reward and support the production of sustainable renewable aviation fuels in the UK. "Providing sustainable fuel production for aircraft with the same economic incentives given to road vehicles is long overdue. This is a major step forward to help the UK aviation industry meet its carbon reduction targets. "These incentives have enabled alternative fuel sources to be developed for cars and lorries, while aviation has traditionally been heavily dependent on fossil fuels. This government initiative will support our plans to build Europe’s first waste to jet biofuel plant in Britain, creating UK jobs and growth." •bringing renewable aviation fuels and renewable fuels of non-biological origin into the scheme. "We welcome the increased targets for renewable transport fuels and are excited by the new regulations which will encourage the production of novel fuels for hard-to-decarbonise sectors. "The UK’s renewable fuels have excellent environmental credentials and their manufacture supports almost 1,000 direct jobs, many of which are in the north-east. As transport is now the UK’s largest source of greenhouse gas emissions and air quality concerns are growing, this makes the transition to a cleaner system an imperative." 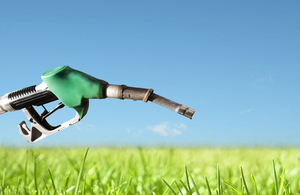 The majority of the biofuel used in the UK comes from waste. By introducing new targets, the RTFO promotes the development of cutting edge technologies to turn waste into valuable low carbon fuels. The changes are in addition to the £22 million of government funding available to industry to develop waste-based advanced low carbon fuels in the UK for aviation and freight. The new RTFO will contribute a third of the total savings from transport for the UK’s carbon budget.